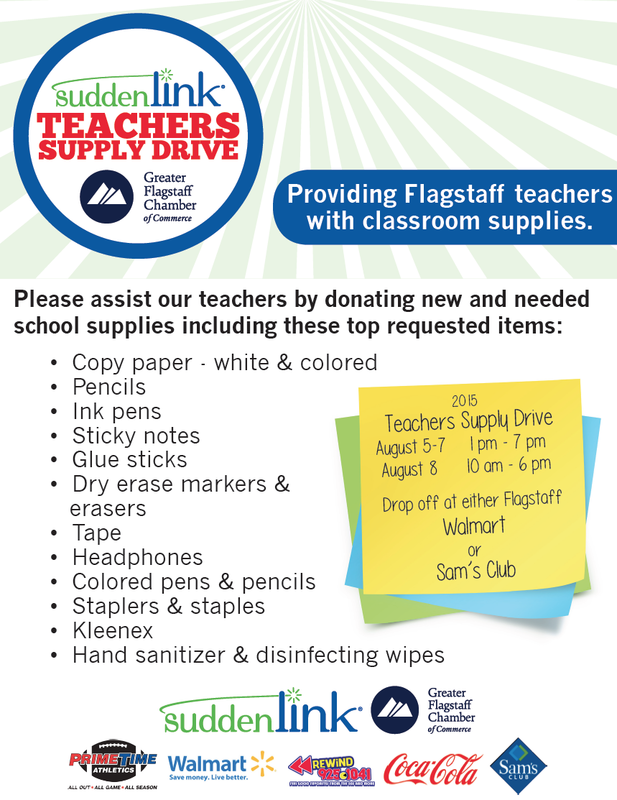 The Flagstaff Teachers Supply Drive will be held Aug. 5 through 8 at both Walmarts and Sam’s Club in Flagstaff. Sponsored by Suddenlink and the Greater Flagstaff Chamber of Commerce, the drive will be held from 1 to 7 p.m. Aug. 5 through 7 and from 10 a.m. to 6 p.m. Aug. 8, with drop off at either Flagstaff Walmart or Sam’s Club. 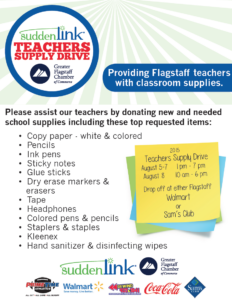 “On its fourth year, the Greater Flagstaff Chamber of Commerce and Suddenlink strengthen their partnership to host the community-wide drive to provide much-needed classroom supplies to Flagstaff K-12 teachers at the beginning of school year,” the organizations reported in a media release. The chamber also conducts its Business Donor Program in which chamber members have the opportunity to Pack a Crate, conduct drive in offices/businesses, donate specific branded items, or match cash donations. « Join ASBA and Expect More in an Upcoming Advocacy Training!